Wallpapering Fog: Are we branding? Or selling? If you've worked in advertising for a while, you'll have come across the question of whether it's ok to compromise the 'creative vision' of a 'brand' ad, by sullying it with practical things like phone numbers and web addresses. Being a data-type person and so not the sort to think that the majority of TV ads have a great deal of 'creative vision', I don't really understand this question, but it's a question that comes up a lot. I wrote some time ago about adverts, which don't have the product that they're advertising in them and ads which don't tell you how to buy the product, fall into pretty much the same category. The challenge of making an ad is to make something that holds people's attention, so that you can talk to them about a product. Holding people's attention for 30" without the discipline of showing the product, is easy. It's a music video. You just show whatever you want and anyone can do that, even me. So we need an ad with the product in it. A comment on the post I linked to above, summed it up perfectly: "Can you describe the advertisement without mentioning the product?" Keep that one in mind as you watch an ad break tonight - it's scary how often the answer is, "yes you can and by the way, what was the product?" OK, Mr. Super-Brand so now you've communicated your product to me and I want to buy it. What do I do next? Oh, you've gone. If it's not blazingly obvious what to do next then you need to tell me, because your ad wasn't that gripping and I'm very, very lazy. Give me a phone number, give me a web address, tell me where to buy your product. Do not make me work hard to buy you. Apple can get away with 'pure' brand ads that have no direction afterwards (but that always, always, have the product in them), because everybody knows where to buy Apple's stuff. Most brands aren't Apple. If a creative agency tells you that their advert won't work so well if it includes your phone number, or retail stores, or web address, or (God forbid) the product that you sell, then they're not doing their job properly. Their job is to include all of those things and still make the ad interesting enough that people will pay attention. That's hard. It's why creative agencies cost money. Here's something that's caught my eye recently; Samsung have taken to sticking their logo in the corner of the screen for virtually the entire duration of a TV spot. 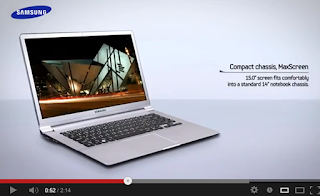 In a laptop ad, this makes perfect sense because let's face it, all laptops look the same. Without that logo, you're asking somebody to really pay close attention to the ad in order to realise whose laptop they're looking at. Why don't many, many more advertisers do this? TV channels do it. Their only purpose is to entertain and they still stick their logo in the corner of the screen! But the advertisers who pay to show their products on those TV channels, don't do it. Why on earth not? The only reason can be due to a feeling that it would make the ad look 'cheap'. Putting your logo on the screen isn't subtle. Maybe we're afraid to be caught actually doing marketing, so we pretend not to. Me? In my 30" spot, I'd want my product front and centre, my brand logo next to it and a dirty great web address on the screen at the end. When you say that would compromise the 'quality' of the ad, are you saying my brand looks cheap? You might want to try another argument.